We talk of trashing our planet – taking more from nature than it is able to renew, speeding headlong towards climate chaos. But much less attention gets focused on the fact that we’re often doing this to create things that will themselves, in very short order, be trash. 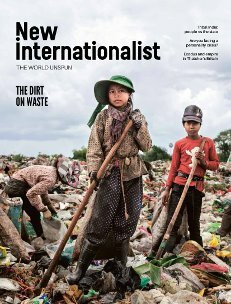 The Waste edition of New Internationalist looks at how our vision of prosperity is built upon the transient and throwaway and argues for a system change to save a planet choking on its junk. Every year we produce plastic – much of which will be discarded after mere minutes of use – equivalent to the weight of every living person on Earth. In wealthy countries, industry spews out 42 kilos of waste per person every single day to keep the wheels of the economy turning. The amount of rubbish we’re creating keeps growing year on year. The discourse around waste has got focused on recycling and what individuals can do to be less wasteful. Important as those things are, they go nowhere near far enough – it’s like picking up the pieces at the foot of the cliff rather than stopping the vandals at the top. Discover what else we need to be doing to tackle the deluge of trash.